Every winter season we encounter the first snow and it takes some time to remember how to drive safely in the snow and ice. Here are a few tips to help keep you safe this winter season. One of the most dangerous and common mistakes is to quickly scrape off a little window to see through and head out the door. Driving a vehicle cold can be hard on the engine. In addition, when the driver is cold it is harder to pay attention to the road. Making sure that all of the windows are clear and easy to see through is important. It is equally important to brush off all the snow and ice from the lights. This will enable other cars to be able to see your car. Brushing off the rest of the vehicle will prevent snow from drifting off your car and hitting your windshield. It’s important to tap your brakes on the road to see how slippery it is while you are going slowly. 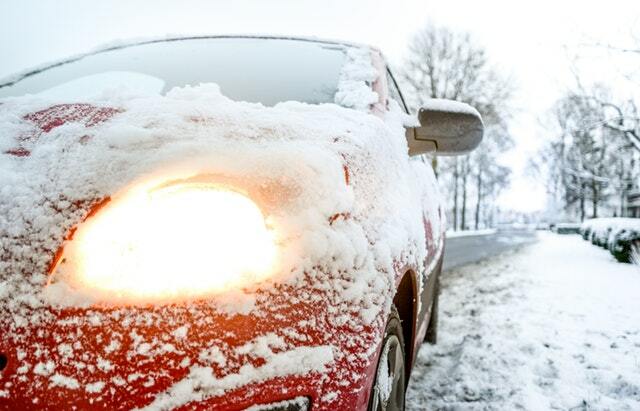 Remember, if you are sliding and your car doesn’t have anti-lock brakes, you will need to pump your brakes so they can get enough friction to start working. If your brakes are working well on the side roads that aren’t plowed well, then they should work well on the plowed roads. However, remember that there are still potentially patches of black ice so it is important to drive at a safe speed. As a rule of thumb, it is a good idea to give yourself 2 seconds to stop before you would reach the car ahead of you. When it is snowy or icy, give yourself 3 or 4 seconds. The distance will vary based on your speed. An easy way to determine the right distance is to pick a landmark like a tree or a road sign and count how many seconds it takes for you to reach that place. If it takes 3-4 seconds, then make sure you leave that much distance between you and the car you are following. This allows you time to react should the car ahead of you stop abruptly. As always paying attention is a good rule to follow, but this is especially important during the snowy season. Remember, some cars are better on the snow and ice than others. It’s possible that the car you are following may only be able to drive 15 miles an hour safely. If your car has better wheels, anti-lock brakes and all wheel drive, this speed seems ridiculous and may catch you off guard. Therefore, it’s important to make sure you are paying attention and taking your time. That way you can catch those slow drivers, ice patches in the road or the car slipping in front of you in plenty of time to react. There is no reason to risk your safety in order to get somewhere quicker.